What does a field archaeologist carry in his dig bag? I like Eric Welch’s answer. Why did people stop eating pork in the ancient Near East around 1000 BC? A new study suggests one answer. A new video from the Museum of the Bible reveals some of the work of the Green Scholars Initiative and the associated educational tools being developed for use in Israel and the U.S.
“Visual data about cultural heritage sites within conflict zones in near real-time has become possible with new technology, particularly satellite imagery.” This article considers the ethical questions. BBC Magazine: The men who uncovered Assyria. Three Jordanians who floated to the Israeli side of the Dead Sea were returned to Jordan. The Oriental Institute of the University of Chicago has several courses and workshops scheduled for the coming months. Now free at The Bible and Interpretation: the first two chapters of Ancient Israel’s History: An Introduction to Issues and Sources, edited by Bill T. Arnold and Richard S. Hess. Sad news: William W. Hallo died on Friday. A funeral service is scheduled for 1:00 pm, Monday, March 30, at Mishkan Israel, 785 Ridge Road, Hamden, Connecticut. The Agade list is now being archived at the SBL website. Just before Palm Sunday, Jesus made the trek from Jericho to Jerusalem. What did he see? A good book to read this week in the days leading up to Good Friday is The Final Days of Jesus, now $3.99 on Kindle. The Temple Institute has built a sacrificial altar to be used in the Third Temple. Leen Ritmeyer comments. Who is buried in the Prophetess Hulda’s tomb on the Mount of Olives? Miriam Feinberg Vamosh considers the question in a premium article at Haaretz. The city of Afula plans to preserve its archaeological remains which span from the Chalcolithic to the Crusader periods. Aren Maeir visited Hebron and took some photos of the ancient fortifications. Leon Mauldin is in Athens now and shares some photos from the acropolis museum. A large underground city has been discovered in Cappadocia. Now $0.99 on Kindle: The World and the Word: An Introduction to the Old Testament, by Eugene H. Merrill, Mark Rooker, and Michael A. Grisanti. Also $0.99 on Vyrso. Malerie Yolen-Cohen suggests 11 things to do in Israel that you may not have considered before. The Holy Land Magazine is directed towards Christian tourists to Israel. Ferrell Jenkins writes about Solomon’s Quarries in Jerusalem and the American missionary who discovered them in the 19th century. Jenkins also shares a great quote from André Parrot who writes that “knowledge gained from books is certainly not enough, for names which are not attached to any reality are nothing more than ghosts.” Read the whole paragraph (and then book your next trip, or start a fund for your grandkid). Turkish authorities are trying to figure out how to increase religious tourism to the site of ancient Ephesus. The LA Times provides some background on the making of the Jerusalem 3D IMAX movie. “The Siege of Masada” premieres on March 27 on the Smithsonian Channel. The one-hour special examines the evidence behind Josephus’ account. Gerald McDermott addresses the question of whether the land of Israel should still be significant for Christians in a chapel message DTS. Iraq’s government reports that ISIS has bulldozed ancient Calah (modern Nimrud). In light of ISIS’s recent destruction of Mosul, Iraq is vowing to protect ancient Babylon. The Oriental Institute of the University of Chicago has issued a statement. Citizens of Iraq and Syria are working to protect their historic treasures from destruction by ISIS. 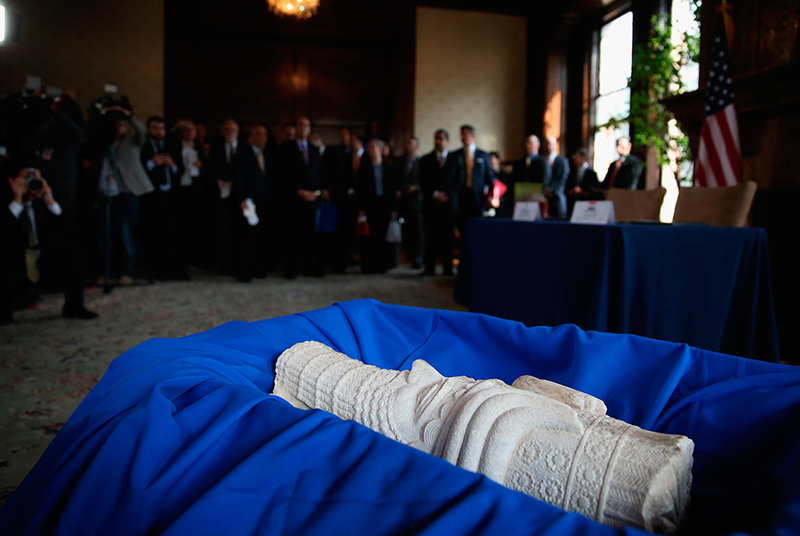 The U.S. government has returned more than 60 artifacts illegally smuggled out of Iraq, including the head of an Assyrian lamassu from the palace of Sargon II. Egypt will no longer grant visas to individual tourists upon arrival. You will need to apply in advance from an Egyptian embassy. Or travel instead to Israel, Jordan, Turkey, or Greece. The Associates for Biblical Research has just released a new video, Digging Up the Sin Cities of Sodom and Gomorrah. How was Trajan’s Column in Rome constructed? National Geographic features a stop-motion video that suggests an method. It is quite an extraordinary accomplishment. In past years, this blog has discussed extensively the identification of Khirbet Qeiyafa, which has been identified with Shaaraim by the excavators. 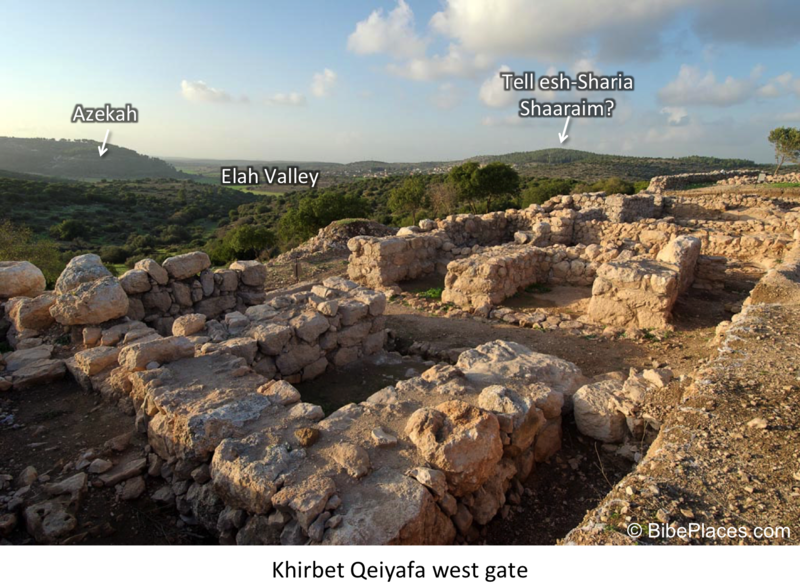 I agree that Khirbet Qeiyafa should not be identified with Shaaraim (see also below), but if Khirbet Qeiyafa is not Shaaraim then where should we locate the biblical town? Shaaraim is mentioned twice in the biblical narrative, once in the Eshtaol district (Josh. 15:36, cf. Onom. 87.1) where it is found between and again in association with the Philistine retreat following the death of Goliath (1 Sam. 17:52). The text states that they fled “as far as Gath and up to the gates of Ekron…on the way of Shaaraim, as far as Gath and Ekron.” This latter context clearly puts the site in the vicinity of the battle, which occurred in the Elah Valley between “Socoh and Azekah at Ephes Dammim” (1 Sam. 17:1). Also, it should be noted that this reference does not actually refer to the town of Shaaraim, but to the road that led to Gath (Tell es-Safi) and Ekron (Khirbet el-Muqqana). Therefore, the text seems to indicate that Shaaraim should be located west and perhaps north of the battle with the toponym likely deriving from the routes that went through the Elah and Sorek Valleys to Philistine Gath and Ekron (Na’aman 2008b:2–3). Garfinkel and Sanor, the excavators of the recently concluded excavations at Khirbet Qeiyafa (2012), have revealed one of the more intriguing ancient sites from the Early Iron Age IIA (i.e. 10th century BCE). They have identified Khirbet Qeiyafa with Shaaraim. This argument is based on three main criteria: 1) Shaaraim occurs after Socoh and Azekah in Joshua 15:35-36, 2) the site is located directly above the presumed location of the biblical battle between David and Goliath, and 3) the site produced two Iron IIA four-chambered gates inside of a massive casemate fortification, which gave the name to the site (Shaaraim = two gates) (Garfinkel and Ganor 2008; Adams 2009:47–66). This identification has received a good deal of criticism from various scholars who have offered different identifications for Khirbet Qeiyafa (Na’aman 2008a - Gob, before changing his mind in, 2012:88; see also Finkelstein and Fantalkin 2012:48; Galil 2009 - Netaim; Levin 2012b - Ma’agal - interpreted as a circular military fortress mentioned in 1 Sam. 17:20; Bolen 2012 - Ephes Dammim, but it is possible that this is a regional term). Simply stated, Khirbet Qeiyafa should not be identified with Shaaraim. This is due to the fact that the dual ending most likely does not mean “two gates” and the site should be located further to the west/northwest (Na’aman 2008b:3–4; see also Elitzur 2004:282–290). This latter point means that Rainey’s earlier identification with Khirbet es-Saireh can probably be ruled out on geographical grounds (see discussion in 1975:69*; but see his later opinion that left Shaaraim unidentified 2006:147). On the other hand, Dagan’s suggestion of Khirbet esh-Sharia, which is situated between Azekah and Khirbet el-Kheisum (Adithaim? ), would seem to fit this geographical requirement (1996a:139). Additionally, Khirbet esh-Sharia would seem to present a compelling toponymic connection with Shaaraim. The archaeological remains at the site are also in line with this identification, as the site has remains from the Iron IIA (30 dunams**), Iron IIB-C (40 dunams), and Roman-Byzantine periods (Zissu 2000:77*–78*; Dagan 2000:site 55). I disagree with Na’aman’s conclusion that Khirbet esh-Sharia is not far enough to the west to match the retreat of the Philistines (1 Sam. 17:52) (2008b:4–5). There are no known Judahite sites to the west of Azekah (i.e. between Azekah and Philistine Gath) and it seems that the Azekah-Tell Judeidah ridge formed a clear topographical border between Philistine Gath and Judah (1983:10–11). Khirbet esh-Sharia sits very near both the Elah Valley route to Gath and Ekron (Dorsey 1991:J6) and the “Diagonal Route” that connects the Elah and Sorek Valley systems (Dorsey 1991:Sh2). In light of Na’aman’s contention that Shaaraim was the “gateway to Judah” (2008b:4–5), it is difficult to understand his hesitation to identify a site that perfectly suits his definition. 2009 Between Socoh and Azekah: the Role of the Elah Valley in Biblical History and the Identification of Khirbet Qeiyafa. In Khirbet Qeiyafa Vol. 1, Excavation Report 2007–2008, edited by Y. Garfinkel and S. Ganor, pp. 47–66. Israel Exploration Socity, Jerusalem. 2012 Pictorial Library of Bible Lands. BiblePlaces. 1996 Cities of the Judean Shephelah and Their Division into Districts Based on Joshua 16. Eretz Israel 25: 136–46, 92*. 2000 The Settlement in the Judean Shephelah in the Second and First Millennium BC: A Test Case of Settlement Processes in a Geographical Region. Unpublished Ph.D. Dissertation, Tel Aviv University, Tel Aviv. 1991 The Roads and Highways of Ancient Israel. The Johns Hopkins University, Baltimore and London. 2004 Ancient Place Names in the Holy Land: Preservation and History. Hebrew University and Magnes Press and Eisenbrauns, Jerusalem and Winona Lake. 2012 Khirbet Qeiyafa: An UnsensationalArchaeological and Historical Interpretation. Tel Aviv 39(1): 38–63. 2009 The Hebrew Inscription from Khirbet Qeiyafa/Neta’im: script, language, literature and history. Ugarit-Forschungen(41): 193–242. 2008 Khirbet Qeiyafa: Sha`arayimn. Journal of Hebrew Scriptures 8(0). 2012 The Identification of Khirbet Qeiyafa: A NewSuggestion. Bulletin of the American Schools of Oriental Research(367): 73–86. 2008a In Search of the Ancient Name of KhirbetQeiyafa. Journal of Hebrew Scriptures 8(21): 2–8. 2008b Shaaraim – The Gateway To The Kingdom OfJudah. Journal of Hebrew Scriptures 8: 2–5. 2012 Khirbet Qeiyafa and the Philistine- Canaanite Struggle in South Canaan in the Early Iron Age. Cathedra 143: 65–92. 1975 The Identification of Philistine Gath. A Problem in Source Analysis for Historical Geography. Eretz Israel 12: 63*–76*. 1983 The Biblical Shephelah of Judah. Bulletin of the American Schools of Oriental Research(251): 1–22. 2000 Khirbet esh-Shari’a. Hadashot Arkheologiyot: Excavations and Surveys in Israel 111: 77*–78*.